Safety – Erection Specialists Inc. THINK – SAFETY IT IS EVERYONE’S JOB. PIENSE – SEGUIDAD ES EL TRABAJO DE CADA UNO. Safety is the state of being free from danger, the case of being protected from harm or other unwelcome outcomes. Safety can also refer to the oversight or management of recognized hazards to achieve an acceptable level of risk. Erection Specialists, Inc. while keeping abreast of the latest changes in OSHA rules for construction and state guidelines places controls in the field to bring about a safe working environment. La seguridad es el estado de estar libre de peligro, el caso de estar protegido contra daños u otros resultados no Bienvenidos. La seguridad también puede referirse a la supervisión o gestión de riesgos reconocidos para lograr un nivel aceptable de riesgo. Erection Specialists, Inc. mientras se mantienen al corriente de los últimos cambios en las reglas de OSHA para la construcción y las pautas estatales, pone los controles en el campo para lograr un ambiente de trabajo seguro. PLANIFIQUE con antelación para hacer el trabajo con seguridad. CAPACITE a todos para que usen el equipo con seguridad. How can you keep them safe? Summer heat is not a joke — construction workers account for about one-third of all heat-related worker deaths annually. Excessive heat can cause heat stroke or heat exhaustion, and just being overheated makes workers more susceptible to accidents or injuries. Here are 7 steps you can take to protect your workers on hot days. Humidity intensifies the effects of heat. The heat index takes into account both temperature and humidity to provide a more accurate measure of how hot it feels than the temperature alone. Working in direct sunlight or while wearing heavy clothing can exacerbate heat even beyond what the heat index shows. Pay attention to weather forecasts, including the heat index, to plan your workers’ schedules. Allow frequent breaks for rest and hydration. Employees should take water breaks every 15 minutes during high-heat days. Drinking small amounts of water frequently is better than drinking a lot of water at lengthy intervals. If shade is not available at the jobsite, provide shade with a canopy or umbrella. You can also set up fans to provide a cooling breeze. You can help prevent heat exhaustion by having employees share the more physically strenuous jobs and alternating these tasks with lighter work. You may also need to schedule more workers on hot days to handle the same volume of work, because each individual employee will be less productive at this time. The right clothing can help workers be more effective in the heat. They should wear light-colored, lightweight clothing that allows for airflow. Clothing with SPF built in can help, too. Hats should provide enough shade to protect the face and neck without blocking vision; a cooling neck bandanna is another smart move. Watch for symptoms of heat-related illness. Make sure all workers know what to watch for in themselves and others, and have them keep an eye on each other — sometimes, it’s easier to see when someone else is showing signs of heat-related illness than to recognize it in yourself. 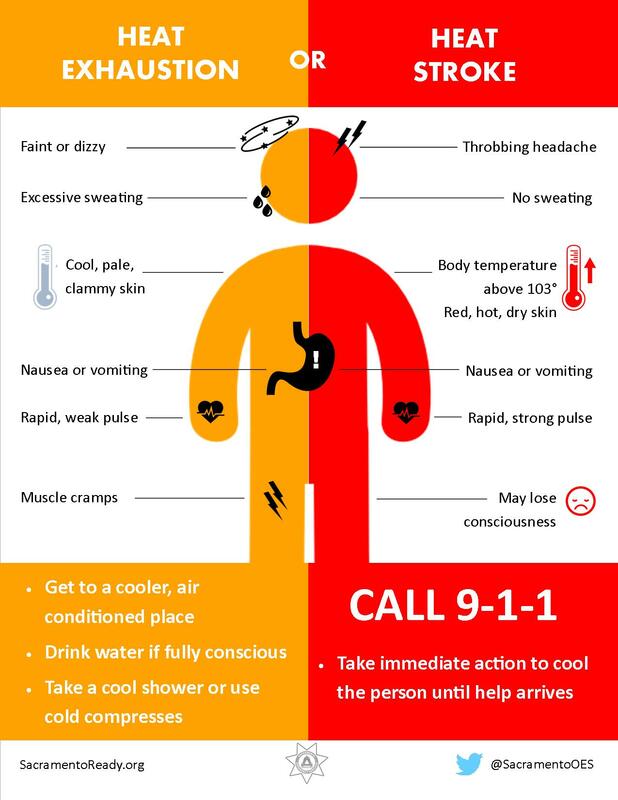 Employees and supervisors should know the warning signs of heat-related illness and how to respond to each situation, including heat cramps, heat exhaustion and heat stroke. Have plenty of water and ice packs available on the job site to help cool employees in case of an emergency. Make sure that workers immediately report any incidents to supervisors so they can take proper steps, including recording the incident. Construction workers who are new on the job are the most likely to be stricken by heat-related illnesses because they haven’t yet gotten used to working in the heat. Similarly, the first hot days of the year will often have the strongest effect on workers. Schedule work so as to allow employees to build up their heat tolerance gradually. Dress for the weather. Vistase de acuerdo al clima. Give yourself extra time in the morning to get to work. Dese mas tiempo en la manana para llegar al trabajo. Take care as you move around the job site. Tenga cuidado al moverse por la obra. It’s not just you that needs to warm up. No solo es usted quien necesita calentarse. Watch out for ice on heavy equipment. Tenga cuidado con el hielo en el equipo pesado. Protect exposed water lines from freezing. Proteja las tuberias de agua expuestas de la congelacion. Take care of your body. Cuide su cuerpo. Work alongside a buddy so you can keep an eye on each other for symptoms of hypothermia. Trabaje junto con un companero para vigilarse el uno al otro en cuanto a los sintomas de la hipotermia.